Monogram tote with shimmer vegan handles and bottom band. When you need to add some glitz and glamour to your late afternoon outfit, this is the tote that will do it! Bordering on day to dusk, it offers a stunning gold vegan trim on a soft white canvas fabric. The stylish bag shape has a reinforced bottom, double handles, interior lined and magnetic snap closure, sets up for an eye-catching tote bag. Large opening allows you to access the day's necessities. 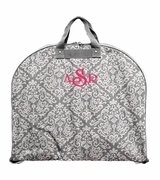 Personalize this tote bag for a wedding or dressy evening event with an embroidered monogram or name. Canvas and shimmer trimmed tote bag measures 22.5"W x 14"H x 7" across the bottom.